Posted on January 10, 2019 at 5:27 am. Up first, it’s time for the monthly Wolves with Character award! Just take a look at the screen to see all the deserving honorees from the 6th, 7th, and 8th grades — all of whom were chosen by their teachers for demonstrating outstanding CARING in their daily lives. Congratulations, wolves with character! 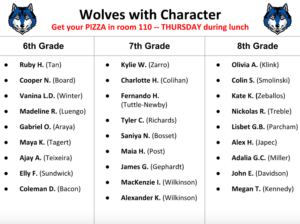 [clap] Be sure to stop by room 110 during your grade-level lunch TODAY and pick up your free pizza! She shoots — she SCORES!! Congratulations to all of the student-athletes who made the WMS Girls Basketball Team! There’s a LOT of talent on this year’s roster — so let’s root them on to a COUNTY CHAMPIONSHIP! And a quick reminder to all players — be sure to bring your completed info sheet to Ms. Sutphin TODAY during Wolf Time in the cafeteria. Calling all MUNners! The WMS Model UN Club will be meeting TODAY during ASP 1 in room 202. Participants will be preparing for several upcoming conferences — so you won’t want to miss it. Please see Ms. Carlson with any questions. And now for an update on the upcoming WMS Spring Musical — Alice in Wonderland, Jr. A “read through” for the TECHNICAL CREW ONLY is scheduled for TODAY during ASP 1 and 2 in the backstage area. Anyone interested in working back stage should attend this important planning meeting. As for the performers, the cast list will be posted later this week. The first ON STAGE rehearsal will be held next MONDAY after school in the auditorium. See Mr. Brown for more information — and break a leg! And finally today, the WMS PTA hosted the annual “Book Fair Fundraiser” in the Williamsburg library last month, and it was an absolute book bonanza. WOLF-TV reporter Laila H. “booked it” to the scene — to bring us this special report.